"Deep in a northern Russian forest of jade and brown, far from any hint of civilization, Valaam Monastery sinks into the seasons of the year as it has for a thousand years before. . . ." So begins the story of John Oliver, a young evangelical American on a journey of discovery a journey that leads him to an ancient Russian monastery, a place of peace and a place of struggle. For on Valaam, he encounters Orthodox Christianity and is reminded that the Christian life is not for the faint of heart. And on Valaam, the treasure of stillness requires a fierce guarding. Touching Heaven is a lovely book, quiet and contemplative, and full of peaceful revelations. A gripping . 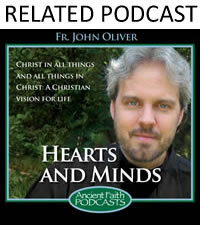 . . account of what drew John Oliver into the deep waters of Christianity and made him an Orthodox Christian.